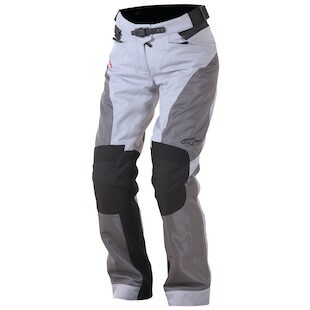 Alpinestars Sonoran Air Drystar Pants: Ready for Spring! Hear ye! Hear ye! Spring is on the way and so are some Alpinestars products that may have actual names that are not just a mash up of Pro, Air, T, G, P, and R. In all seriousness though Alpinestars is an amazing brand with a long standing history of putting out well made, functional, stylish, and safe products. Good overpants are often a hard piece of gear to find, and while Alpinestars has had some summer weight over pants in the past, they are due for an update. Please allow me to introduce the new Alpinestars Sonoran Air Drystar Pants for men, and the Alpinestars Stella Sonoran Daystar Pants for women. The new Alpinestars Sonoran Air Drystar Pants are a welcomed addition to their pant line-up. These new overpants have textile on your typical impact areas such as the knees, seat, and hips, and high flowing mesh in the non-impact areas. Accordion stretch insert on the knees and waist give you extra mobility. While the adjustable waist closure and and side strap adjustments allow you to dial just the right waist fit. The pants feature a removable Drystar waterproof liner that is lined with fleece for additional heat retention. This drop liner, coupled with the mesh paneling, means this pant offers A LOT of temperature flexibility. Depending on your specific climate you can most likely expect this new pant to work well from early late Spring to early Fall. 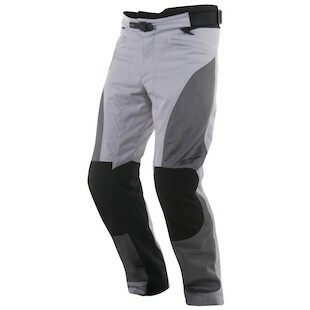 Theses pants come standard with adjustable and removable CE approved Bio Air knee armor as well as a connection zipper to mate the pants to almost any Alpinestars jacket. It’s a home run. The absolute best thing that I can say about the Alpinestars Stella Sonoran Air Daystar Pants is that they are exactly like the men's version, just cut for a woman's body. Safe features and safety. As the significant other of a female rider all I can say is thank you, thank you, thank you. Historically many brands have created women’s gear based on men’s gear, but often the women's gear is missing key safety and design features that are included in the men’s version. For once this is not the case and we are outright stoked about it. If the 2016 season is time for new overpants please give these a second look, especially if you are a lady rider! The industry is trending towards providing better women’s gear and these new pants are definitely a trendsetter in that regard. So show the folks in Italy you are proud of them and make your next purchase a piece of Alpinestars gear.